“Universal Economics'” 680 pages, not including its glossary and index, reflect a friendly chat I had with Professor Alchian during one of the UCLA economics department’s weekly faculty/graduate student coffee hour, in which he said, “Williams, the true test of whether someone understands his subject is whether he can explain it to someone who doesn’t know a darn thing about it.” That’s precisely what “Universal Economics” does — explain economics in a way that anyone can understand. There’s no economic jargon, just a tiny bit of simple mathematics and a few graphs. 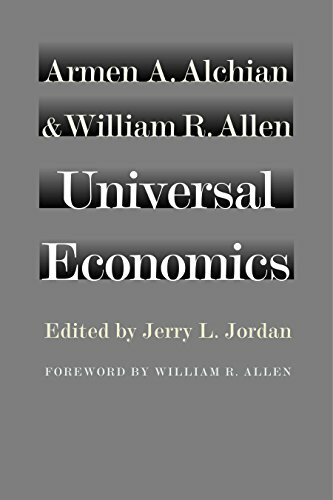 Universal Economics Armen A. Alchian, Will... Best Price: $10.41 Buy New $13.44 (as of 08:45 EDT - Details) Chapter 1 introduces the fundamental issue that faces all of mankind — scarcity. How does one know whether things are scarce? That’s easy. When human wants exceed the means to satisfy those wants, we say that there’s scarcity. The bounds to human wants do not frequently reveal themselves; however, the means to satisfy those wants are indeed limited. Thus, scarcity creates conflict issues — namely, what things will be produced, how will they be produced, when will they be produced and who will get them? Analyzing those issues represents the heart of microeconomics.